I toyed with a bunch of different possible ways to celebrate the milestone of having created 100 different panini on Panini Happy. One thought was to grill 100 mini-panini and arrange them to spell out 1-0-0. Another was to stud a sandwich with edible diamonds (I read somewhere that the traditional gift for a 100th milestone is 10-carat diamonds?? Plus, I have these gorgeous sugar diamonds I’ve been aching to use). My husband suggested Hundred-Year Egg Panini, for a Chinese-inspired approach (I told him we didn’t have time to wait for that one…ha ha). To hone my brainstorming, I reflected a little on what Panini Happy is really about…what it’s become over the past 99 recipes. As much as I’ve enjoyed recreating the “standards” on the blog – the Reuben, the French Dip, the Monte Cristo – I’ve had the most creative fun with some of my more original sandwiches. Among my favorites have been this summer’s Peach Caprese Panini, with fresh peaches, mozzarella and prosciutto and my Gingerbread Blondie S’mores Panini from the last holiday season, with marshmallow cream, dark chocolate and clementine zest. 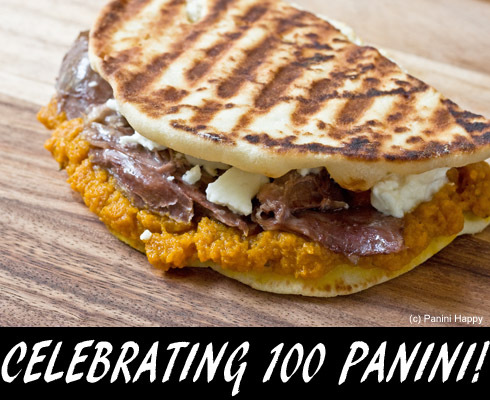 Now I can add to the list today’s Pumpkin, Duck Confit & Feta Panini – my 100th recipe! You know I had to pull The Flavor Bible out to guide me on this one! 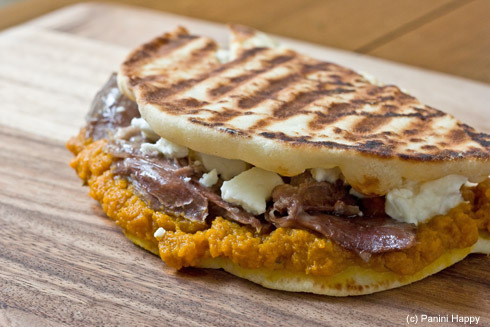 It turns out that both duck and feta go well with pumpkin, who knew? The key to these panini is to not overdo it with the pumpkin. You’ll see in the photos that I have a pretty good ooze factor going – that’s for show. Treat the pumpkin more like a condiment than a sandwich ingredient. It adds a gently sweet complement to the duck confit as well as a bit of moisture to the sandwich overall. The salty, creamy feta and sweet drizzle of honey further amp up the flavor. Add the buttery crunch of the toasted flatbread and you’ve got an amazing autumn combination you have to taste to believe. In a small saucepan, heat pumpkin purée, sage and thyme over medium heat. Season with salt and pepper to taste. Keep warm. For each sandwich: Spread a moderate amount of seasoned pumpkin purée on one flatbread half (NOTE: You probably won’t want to use quite as much as I did in the pictures – I added extra so you could see the pumpkin!). Add layers of duck meat and crumbled feta. Drizzle honey on top and close the sandwich with the other flatbread half. Brush a little melted butter on the outside of the flatbread. Grill for about 5-6 minutes until the feta softens and the flatbread is toasted. 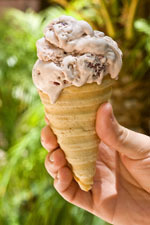 Cut in half, serve immediately and enjoy! I’m charmed by this, especilly the layer of pumpkin. Sounds so yummy. 100 amazing and creative paninis to taunt me. A panini maker is on my holiday wish-list this year, so I can get after all of these! Congratulations on reaching 100! Great site, thanks! Congrats on 100! Our panini press sadly sits in the cabinets, looking very forlorn. I need to bring it out and start making some sandwiches again. Congratulations on reaching 100! I’ll have to add duck confit to the grocery list! Congratulations on 100 panini! That’s incredible! This panini sounds quite decadent. I would love to try it. That looks like an awesome way to celebrate 100! Duck is so great. Happy 100 panini!! What a way to celebrate. Happy 100th panini. 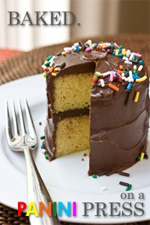 Your 100th one is certainly delicious looking. I can’t wait to see what other paninis follow this one. Congrats on your 100th ! I love the combinations of ingredients. And I am a lover of panini, in any size or shape. I am also a Mom of a girl and baby boy, just on the other side of the world, the country where panini are from. Ciao! That panini sounds a little crazy with those ingredients. (The good, awesomely delicious kind of crazy, of course :)). Holy moly! One hundred paninis is quite the accomplishment. And you picked a beaut to celebrate with. Duck confit is irresistible. So nice to meet you at BlogHer Food and to be on the ethics panel together. Was a very fun time! So nice to meet you at BlogHer Food! A few years ago, I bought all my kids panini presses for Christmas. Then, we had a “Panini Throwdown” in our family – everyone brought their own ingredients and made paninis. We had our neighbors come and judge – it was one of the most fun family dinners we have ever had. I’ll come back to get some more panini ideas! Congrats on the big 1-0-0! Many more to come for you.